She follows me around all day and snuggles into my arms. She is almost 100% house trained and has not messed since arriving. She goes to the toilet in the garden and stays clean in a crate overnight. She learned to sit today and is highly responsive. I am training her to give paw and 'come' right now. When let off the lead she runs like a staffy - very energetic and happy to be here. She will return on command after training, as her character suggests that she is going to be very very responsive. Very intelligent. She is medium sized, about 12k. Looks like a mix of shepherd, terrier and some other things.....a typical moggy dog :o)) She snuggles close and is very good in the house. 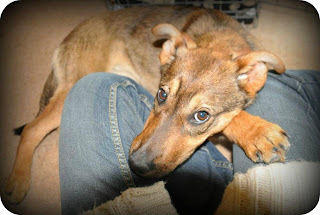 She is currently being fostered with me 35 miles from London in rural East Sussex. I am looking for a forever home for her. She requires an owner to be with her most of the time due to her clingy nature. She could also do with some other dogs, as she craves company. Contact Romania Animal Aid if you could offer this little one a safe and loving forever home.